And He has Shaken - Not Stirred- the Touch Screen Industry. What is this Optical Bond you’re talking about? 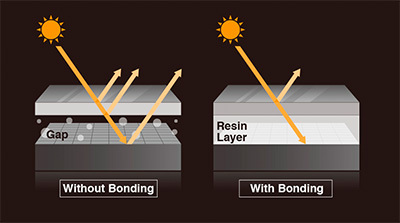 Optical bonding is one of the methods of attaching (gluing) a protective cover glass with a touch screen or touch sensor. Optical bonding has gained popularity due to its advantages over the previous, most popular choice: Air bonding. Before optical came into view, air bonding was the simplest and most economical way of bonding a cover glass with a touch screen or a touch sensor. Well, the process is straightforward: adhesive is placed in the perimeter of the frame of the sensor (what we call the bezels). Once adhesive is set, the cover glass is then placed on top of the stackup. This leaves a small air gap between the front panel material and the rest of the stackup. As we will see later on, this air gap creates various problems. To eliminate these problems, another optical bonding method has been developed. In optical bonding, liquid optically clear adhesive (LOCA) is spread over one side side of the cover glass. This side is then turned and bonded on the touch panel. Optical vs air bonding. Image courtesy of Eizoglobal.com. This is a more delicate process since the adhesive has to be spread evenly and without bubbles. The adhesive is then cured in a process that usually involves heat or UV lights. Why optical bonding has shaken the industry? So far, we have established that air bonding is easier, cheaper, faster and less complex. It also leads to a heavier sensor, because of the extra weight of the adhesive. So, why does removing the air gap justify the extra effort of optical bonding? 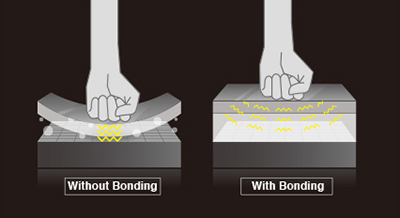 Optical bonding dramatically increases both physical durability and impact resistance. This technique enables the designer to use custom cover glasses and glue enhancing layers on top of them. These enhancing layers includes layers with optical or mechanical properties. For example a designer could add an anti-scratch or an anti-glare layer on top of the standard cover glass. See more such layers and how they affect the touch sensor here. In applications that have to survive harsh environments (e.g. in aerospace, military or industrial applications) touch screens have to be able to withstand vibrations. Optical bonding improves their tolerance to vibrations. If the stackup is air bonded to the cover glass, then the whole structure rattles, as is it only kept in place by the adhesive peripherally. Optical bonding provides more contact between the adhesive and the structure resulting in a more sturdy sensor, better locked into place. This can lead to a sensor with a larger life cycle. Deflection reduction. Image courtesy of Eizoglobal.com. Deflection is the degree to which an element is displaced under load. While fingers do not apply enough load in the cover glass, stylus operated device face enough of it. When optical bonded, the cover glass is better supported by the stackup bellow and the deflection is minimized. In applications where there is a screen behind the touch sensor, optical performance is critical. The rule of thumb is that at least 90% of the light should be transmitted through the stackup. Another optical related problem is reflections: especially in devices used outdoors or under heavy direct light, reflections should be minimized. Reflections severely affect the readability of the screen, so they should be minimized. Optical bonding does that. Reflections happen due to a phenomenon called refraction. Refraction (or as it is more commonly referred to, glaring) is the phenomenon of light being deflected in passing obliquely through the interface between one medium and another. Glaring. Image courtesy of Eizoglobal.com. The amount of glaring depends on the refraction index of the medium light travels through. The closer the refraction index of two materials is, the less glaring will happen. In air bonds, the external light (e.g. sunlight) first travels through the cover glass, then through the air gap and then onto the next of the stackup. In optical bonds, the path is through the cover glass, to the LOCA and to the rest of the stackup. Glass has a refraction index of 1.52 to 1.62 (up to 1.77 if it is sapphire glass). Air gaps have a refraction index of 1 and LOCA of 1.35 to 1.48 (the values vary depending on the manufacturer). So, the refraction index of LOCA is much closer to that of the glass than to that of air. That is why, optical bonds drastically reduce glaring. Parallax is the difference in the apparent position of an object viewed along different lines of sight. When air bonding is used, displays will have a significant amount of parallax. In these cases, the amount of parallax increases as the thickness of the adhesive (which is equal to the thickness of the air gap) increases. Optical bonding totally eliminates parallax as light is forced through a single index of refraction. Moisture, dirt and dust can all find their way in the air gap. In environments where temperature fluctuates a lot, touch screens get foggy because of the condensation from moisture in the air gap. This again affects the readability of the device. The presence of contaminants (e.g. dust) also increases the chances of failure of the adhesive. Optical bonding solves this too. It prevents condensation and eliminates the potential of contamination, resulting in an expansion of the life of the product. From an electrical engineering point of view, air gaps are insulators. Insulators are used on the stackup of a touch sensor to achieve the desired sensitivity of the sensor. LOCA, is also an insulator. The main difference between the two, is their dielectric constant. Air gaps have a dielectric constant of about 1, while LOCAs of 3.5 to 4. This means that as far as increasing sensitivity is concerned, air gaps look like a poor choice. Reduce the ground loading on the non-touch side of the stackup. Reduce the sensitivity of the back side of a portable device. Reduce the touch sensitivity when it is on the touch side of the stackup. Even though an air gap can be present in various locations within the stackup, this article focuses on it being right below the cover glass. So what happens if it is there, as far as sensitivity is concerned? Luckily, we have developed a tool that can provide an answer easy and fast to this question. SENSE is a simulation tool, specifically for pcap touch sensor design. We simulated two versions of the same sensor. In the first case, below the cover glass is an air gap, simulating an air bond and in the second case there is OCA below the cover glass, simulating an optical bond. Without needing to draw any CAD, I chose the materials I wanted from the library and set up a diamond double pattern sensor. The whole pre-processing took me less than 5 minutes, since SENSE automatically meshes the designs and does not require any boundary conditions to simulate the model. A sensor with air bond as simulated in Fieldscale SENSE. A sensor with optical bond as simulated in Fieldscale SENSE. It is expected that the design that features the air bond will have a worse sensitivity. To confirm this speculation, I had to wait just five minutes, since that was the amount of time it took SENSE to produce the results. The results of the model with the air bond as produced by Fieldscale SENSE. The results of the model with the optical bond as produced by Fieldscale SENSE. This is an easy 3-0 win for optical bonding over air bonding. It has the edge in all 3 categories under investigation. Using an optical bond results in a sturdier sensor with more clarity. Sensitivity-wise the two had to be compared head-to-head using simulation. As you can clearly see in the pictures above, the results are pretty easy to interpret. The sensitivity of the mutual capacitance is 25.25% in the first case and 27.73% in the second. That means, that keeping all the specs the same and just using an optical bond instead of an air bond results in a sensor that is about 10% more sensitive! That may not sound like much but it actually is! For example to get the same increase in sensitivity, a designer would have to opt for a thinner cover glass, that would impact negatively the sensor’s mechanical properties. But by using optical bond the designer results in a win-win situation. Wanna shake up your own sensor design? Get your free trial of SENSE and explore hundreds of what-if scenarios in a few clicks! P.S. Even if you are Goldfinger, we got you covered. SENSE simulates any pointer, finger or stylus.